Born during World War One, the Italian trench journasl were items distributed to the army. In a first time they’re written in war zones and circulated through battalions and regiments. No signs of propaganda and patriotism are noted. Only you can find a light satire tolerated by military authority. Most important themes were treated in humoristic, recreative, cultural tone, in any case adapted to each context. Readers’ circle was extremely limited, considering the lack of resources and, in consequence, the low run. It not seldom caused the lost of these rare exemplares. Later, in every country, journals gained attention from authorities and Italian army, for its part, decided to encourage this activity. Run and readers increased, even because the delivery was planned togheter with private correspondence. The articles became a strategic instrument for propaganda: their task consisted in supporting troop’s mood. 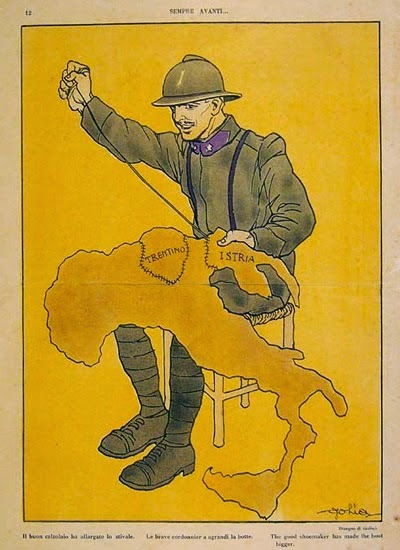 If we look at the Italian front, we can see an increase of publications after the Battle of Caporetto (October 1917). In that period is established the so called service P (P stands for propaganda) which curated many aspects bound to media.In spite of a stronger attention, a complete view of such extended phenomenon is very hard to achieve. Infact the item kept its original volatility. Something similar you can meet on the opposite front under Austrian Command: the «Tiroler Soldaten-Zeitung» directed by the famous writer Rober Musil from 1916 to 1917. However it was an anomalous experiment compared to the standards of this kind of publications, because had a weekly issue and counted about 20-22 pages. Some main collected titles at the Library of Resurgence Museum in Bologna are: "La tradotta", "La Trincea", "La Ghirba", "Signor sì", "Il Razzo", "Il Montello", "Il San Marco", "Sempre Avanti", "La 50a divisione" and "La Giberna". We want also introduce some Italian projects and multimedial useful spaces to deepen this matter. Francesco Maggi, blogger and scholar from Genoa, has written for his website many detailed articles on different reviews of the period. Each journal is object of well-curated analyses and long commentaries. A link is here. Then we suggest to visit the this link where you find a list of many reproductions of the originals. Finally, don’t forget to enter the website of the aforementioned Resurgence Museum in Bologna – WW1 section is here – a necessary guide to this fascinating war publishing planet. Last but not least we could end suggesting a contribution, namely "I giornali di trincea", in Da Caporetto a Vittorio Veneto by Fiorella Bartoccini (Trento, Arti Grafiche Saturnia, 1970).